You can choose the app or mobile game your reported to us as your favorite. Or you can pick a different one. How would you use it educationally? What curriculum, what class, course or training? Can you tie it to common core or competencies? Is it stand-alone or do you have students blogging or using social media along with the mobile game or app? FWIW, these are some of the apps getting a lot of use in my classroom. They are not all (or even mostly) games though, because we have a single iPad in our room. 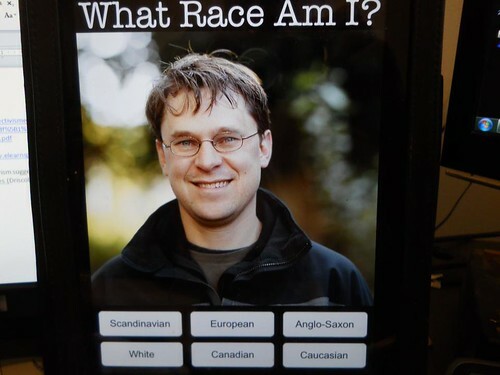 My app favorite remains "Guess my Race" because it can be on any mobile device and can be passed back and forth. Although the "races" or "ethnic" choice isn't really so clear cut, many of the "faces" consider themselves more than one, it does open a dialog among students/players on just how do you define "race" and "ethnicity" as well as what is "self-identification." It works very well for my cultural anthropology classes but would also work well for other disciplines. Well just erased the longest post of my life by accident so here is the abbreviated version lol. We have 2 classroom sets of iPads in our lower school (pre-5) and we are 1:1 iPads in our middle school (6-8). We have quite a few apps that we use depending upon the subject being taught (content specific like Stack the Countries, Kahn Academy, iTranslate, etc) and apps that we use in all classes (like Socrative , Notability, etc). All of our use of apps is tied to our content and standards. I am the Librarian and Technology Integrator. I teach Information and Digital Literacy etc.. All of my lessons are tied to the common core, AASL standards and the ISTE NETs. I do not use blogs etc with my students. I do use a wiki for my own content and to communicate with my students. They can comment, "discuss", and leave messages there. The two apps I am most excited about at this time are Explain Everything which is basically an app you can use to explain anything using audio, video, docs, Internet, pics, text, annotation, etc..
My students are currently using this to make presentations for a project where they are using a combination of research and their own wants/ needs to design a new library for our school. Their presentations will actually be used as the student voice in our upcoming redesign/ renovation of our school library. So the project combines the skills they need to learn with a real world application. The second app I am excited about is Aurasma. Aurasma is an augmented reality app. See more here: Aurasma . I am just not quite sure what i am going to do with it yet. There are the obvious choices - a library scavenger hunt, added value to books, posters, objects in the library, a value added "tour" of the campus using it to add info about the buildings etc but I feel like I am having trouble thinking out if the box with this one. Maybe it's because I don't know enough about augmented reality? I am not sure. First, Explain Everything looks awesome! Thank you so much for the screenshot. Augmented reality gives a lot of possibilities, actually. I found a few resources of other teachers who are using it or trying to use it. http://mrparkinsonict.blogspot.com/2013/01/augmented-reality-in-classroom.html - He's using augmented reality in several ways. He mentions that it adds a "WOW factor" to presenting these things to kids. This bothers me a little bit because there always needs to be solid pedagogy behind using a technology as well. In a few years, AR will be just another tool in the toolbox.
" Making a truly interactive display, rather than putting up work with explanations from teachers, examples of work could be used to trigger video explanations from the children. Cross curricular opportunities can be used to link writing with art or drama by using a picture of a story to reveal artwork linking to that story. When looking at an example of a particular text type children can scan it to reveal the features used or more of an in depth analysis." Also, students could create a narrative or even a game using AR. They could map out the sequence of it first, then build it. They could use it to "present" to another group of students. It's almost like being able to hyperlink from objects. This one gives more general, conceptual ideas. If you all get a chance, take a look and see what you might do in your classroom! At this point, I can't really integrate mobile learning because, believe it or not, a lot of my students don't own mobile devices (some, though not all, of them own smart phones, but those are often hard to write and/or create on). My uni is working on a 1:1 iPad initiative, so once that's the case, I'll be able to integrate mobile learning/gaming. One app I've been using in a game-like way is "Show Me," which allows you to do screen captures of PDFs while annotating. I've used this to record a class-wide "walkthrough" of a student's blog post as we analyze it for effective and ineffective writing practices. I can then share this "walkthrough" with students for them to review. Once students have iPads, I could have them actually record a "walkthrough" of their own writing. Also, last year I participated in Digital Writing Month and we played a Twitter game called Twitter vs. Zombies (I didn't get to play long, as I came down with the flu). I think something like this would be a good way to encourage students to monitor and respond to the class's Tweets. Thanks for the links Leedale! They were very informative. I am still brainstorming but the new ideas are really getting my brain moving. Check out the links I tweeted out last night like the Educational uses of aurasma youtube channel. Go to youtube channel. Mina Zedword, Twitter vs Zombies sounds fun. I have also seen students write a collaborative story on twitter using 1 classroom account with each student posting in turn but not knowing what the student before them was going to post until it was posted. Creative & fun! Interestingly, I have the same issue. Perhaps 1/4 of my class has any kind of smartphone. Of course, the other issue is that I teach techie things on huge Mac computers (I love my job), so I don't actually need them to bring their own devices. :-D I'd love to get them up and moving around, though. Maybe moving around campus looking at design? That sounds neat! I really love apps that let me do voiceover and annotate as I go. I like Educreations for that reason, also. It kind of requires that you can draw, though (I can't). @leedale Thanks! Lol I just work with them a lot. I did use Educreations before moving to Explain Everything. I think the biggest differences are you can record screen by screen in EE, you can always go back and edit everything before or after recording, and you can add and annotate way more things in EE. At my last school, I also had the not enough devices problem. I used different strategies to combat this like stations (some on computers, some engaged in other activities, then switch), using their own cellphones-iPods-etc, grant writing for equipment, whatever I could. I think that is one of the biggest issues/obstacles to k12 technology use today. [quote_post7583653 user=768203]My app favorite remains "Guess my Race" because it can be on any mobile device and can be passed back and forth. Although the "races" or "ethnic" choice isn't really so clear cut, many of the "faces" consider themselves more than one, it does open a dialog among students/players on just how do you define "race" and "ethnicity" as well as what is "self-identification." It works very well for my cultural anthropology classes but would also work well for other disciplines. Hope I did this right ...anyway. I really am interested in using this game for building understanding between students in my groups. Too often I see students who do not acknowledge their cultural backgrounds indicating a denial of themselves. Thank you for sharing! I took a look at the Aurasma app. It seems really neat but I struggled with how to use it myself. I was trying to think of a way to connect on a personal level but also would need to know more about it. I think it would be awesome in an art class setting if you could print out and add to it with other media. I use a lot of meditation apps in my work. Especially to practice self calm . I find preteens pick up on it really quick. I also use a variety of counseling apps to help prompt or cue students, as well. I let them play for a few minutes and then begin the counseling session. Apps I have used are: eCBT Calm , eCBT mood, and RELAX. I was going to try and suggest teachers put these apps on their IPADS and have students practice self calm skills either individually or as a class . I have used Minecraft PE, Swordigo, and BLOT as well at times, but I have only my IPhone to use. No IPADS for social workers yet in my district. Definitely not about fun, flow, or fiero! But students find them helpful and I have to admit I use them myself if it has been a crisis day...mediation apps. I am burned on adding mobile learning apps to my class, like mentioned by others, not all of my students have smart phones with full unlimited data stream access to the internet at 3G or 4G rates. Until what I offer to any of my students is available to all of my students, I can't do it. Also with the mobile app, especially with adding geo-location, it would be so difficult at my college as I would have to have field trip approval a month in advance in order to allow them to transport themselves to any location other than the college. I am going to check into it for Fall, but not really hopeful. I might be able to do something in their home areas (some travel 60-100 or more miles round trip to come to the college). If the mobile app also would run on a PC, some do, an example would be the Minecraft APP, but the real one isn't free, just the demo. I am held up because of $$$ and approval. Any suggestions FREE APPS that also have PC APP for adult community college students in Anthropology or Ethnic Studies? I could use some suggestions. I think Aurasma is meant to be used more like a QR code where if a student made something in art then added links and video that related to it in Aurasma or to take a primary source for my class and add links & more info in Aurasma. Thanks for your reply. My reply has now given me the primary source example to use with my classes! I like an app that is both mobile and available on the laptop. We have iPads in the building. But I don't have any in the lab. Only our lower grades are using them and they do love them. It does seem that they are mostly used for math rote learning. But we do have a tech committee and we all just got iPads. That has been very helpful as I have been supporting the classroom teachers with my personal iPad. So now I can explore what's available much easier. But to answer the question - Socrative. I have used it in my lab polling students and also in Professional Development polling teachers. It's great when your audience has a mix of devices. i agree, I like apps that are PC and mobile. I have an iPad and a mobile ANDROID mobile device and an iPod touch, but games on those smaller devices, like Minecraft are difficult for me to manage. FAT fingers. I will have to check out Socrative. . . wish I could buy a tablet or iPad for every one of my students and pay for the full=-time internet unlimited access for the semester. . . but as the saying goes, "If wishes were horses, beggars would ride." We use www.screencastomatic.com - actually it's not an app, as far as I know, but the output works on iPads and ipods. So, it's mobile compatible. 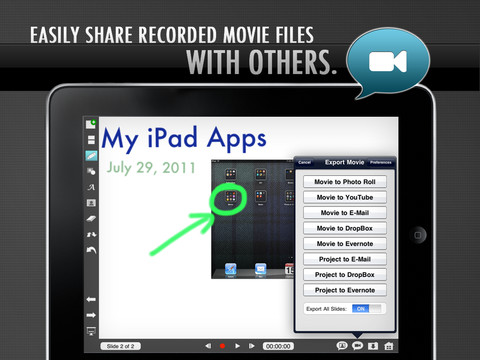 Easily captures anything on screen (applications, powerpoint) as well as webcam and voice. It uploads to YouTube as an option. They have paid service tiers (not expensive) and free tiers of service. I will have to look into Explain Everything, that sounds like it could be a good tool for us as too. That sounds like a great app. I will be looking into it, the screen capture and then get it somewhere on the iPad does always have me looking for my personal list of directions. I also am going to look into explains everything.... Thank Marvin.